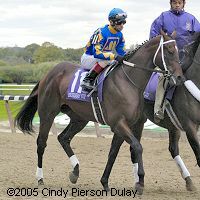 Note: Winner of the Futurity at Belmont Park and the Kentucky Jockey Club at Churchill, he stopped badly to finish last in the Breeders' Cup Juvenile. Another one with a beautiful dosage profile for the Derby. Waited until March to make his first start of the year in the Rebel where he was a miserable 7th and never really in the race. Gave a better showing in the Arkansas Derby, running 2nd or 3rd behind Lawyer Ron the entire way, finishing 3rd when he couldn't hold off the late run of Steppenwolfer. Was never a factor in the Derby and finished 15th.